If you’ve never read Murakami before I do not think there is anything that can prepare for what you are about to experience reading “1Q84”. The whole unease that gets to you throughout the story, the alternating thoughts of “Oh, I think I’m starting to get it” and “OK, what the hell is happening?” and a pretty much open ending are things I’ve only been faced with when I read “House of Leaves” by Mark Z. Danielewski. During the time I read this story, which in Romanian is separated into three volumes, I was telling my friends how interesting and different this story is compared to anything I’ve stumbled upon. Chapter by chapter I was also trying to make sense of the story and not just take it as it is, weird and highly mysterious. I am aware that there is a risk of blowing up the whole magic of the book, but I enjoy going into deeper meanings and trying to figure out what was the author trying to express and achieve with the story. Now I will tell you a bit about the story and why I think it’s worth the read. The other timeline we follow in this story is the one of Tengo, a young maths teacher who wishes to become a writer. A friend of his who works at a publishing house comes to him one day with a tempting offer. He proposes that Tengo rewrite this fantasy book called Air Chrysalis, by a teenage girl, that has a lot of potential to win a literary prize and become a bestseller, but it needs to be “polished”. Neither Tengo nor Aomame can imagine what they are getting themselves into by choosing to take the paths presented to themselves, but it sure makes for a quite interesting journey for the reader. We are also presented with an isolated religious cult, an old lady with an agenda that offers shelter to victims of domestic abuse, talks about what reality is, about love, religion and belief and an alternate world that holds 2 moons on its sky and tales of Little People that make air chrysalides. You are probably wondering about the title too. 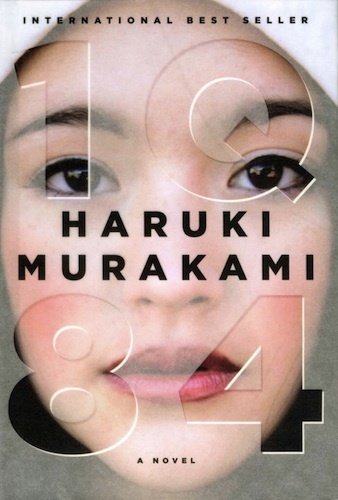 The action starts in 1984, but then continues into an alternate world that Aomame calls 1Q84: Q stands for question (a world that bears a question) but it is also how number 9 sounds in Japanese („kyū”, „kew”). It also is a reference to the book “1984” by George Orwell, but as I have not read the book by Orwell I cannot say how similar the stories are, only that elements from “1984” are mentioned in “1Q84”. Besides the weird and highly mysterious sci-fi story, which I was half expecting, I was impressed about how much the book references to writing itself mostly through the character of Tengo. Murakami is surely not known for being conventional and you can easily spot that from the starting chapters of this novel. He also admitted to not being a fan of writing rules, also stating that he enjoys writing not knowing what the next page could bring and not sticking to a certain style or genre. This might as well be a way for chaos to manifest, but I assure you it’s the opposite. It makes for an interesting and rewarding experience if you ask me. Yes, the story is long and if you are afraid of big books this might kill the enthusiasm at first. At times, this story might seem very monotonous and it might feel like the story is dragging on and nothing is happening, but looking back it was worth it because describing people’s routines adds a new layer to the feel of a story. Also, if you are the kind of person that looks for closure at the end of a book, this need of yours is only partially met at the end of “1Q84”, many mysteries are left unanswered and you are going to have to live with that. Bottom line, this will not be the first and last book by Murakami that I will read. While many say this is not exactly his best work, in my opinion it did its job. For me, it opened a new world, and while it wasn’t a comfortable, warm and fuzzy one, I felt that at the end I left that world with much more than just a catchy and at time suspenseful, weird story: an experience that will stay with me for a while, an author that inspires me to read and write more and with courage to break the rules once in a while and see where that might take me creatively. Have you read any of Haruki Murakami’s books? Anterior What makes a book good?